Sir Ken Robinson’s plea to nurture creativity in children, Jill Bolte Taylor’s stroke of insight, Elizabeth Gilbert on the genius inside all of us. The three most popular TED talks three most popular talks ever all deal with the brain, education and creativity? The Society for Neuroscience, a nonprofit association of thirty eight thousand brain researchers and professionals, recently launched a series of educational initiatives for K-12 students, including neuroscience core concepts. The Dana Foundation for Brain Research partnered with the Society for Neuroscience to launch Brain Awareness Week, a campaign to educate and excite people of all ages about the brain and brain research. At the University of Washington, Neuroscientist Eric Chudler and his team run the popular website Neuroscience for Kids. The University Of Minnesota Department Of Neuroscience created BrainU, a repository of free educational resources and materials for grades 5 through 12. Engaging student imagination promotes learning for all ages groups. The more students come to understand their own brains, the better able they are to take advantage of them. 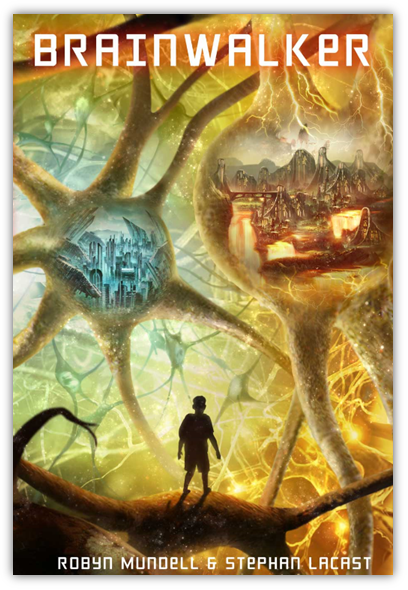 Brainwalker, a science-fantasy novel in which 14-year old Bernard takes a fantastic journey inside his father’s brain, can be a useful tool to teach students key concepts of neuroscience and cognitive sciences. Bernard is introduced to the brain’s amazing, universe-like scale, complete with neurons and the trillions of synapses they form. Through his encounters, he unearths different parts of the brain and the roles they play in shaping our personality. While striving to reignite sparks of creativity inside his father, he learns about neuroplasticity. Here are some suggested classroom activities centered around the different story elements in the book Brainwalker. Ms. Needleman, Bernard’s science teacher, tells the class that in there are cells in the brain called neurons, and that, “electrical impulses are transmitted from one neuron to another and that’s how thoughts are made,” and Bernard asks if that means that if you open a neuron you’d find a thought inside. This is an example of visualization, showing how Bernard’s mind works. What are some other ways to visualize thoughts? Bernard tells Basilides the Holon that thoughts come from your head, Basilides says that sometimes it feels like his thoughts come from his stomach, and that other times they seem far away, almost as if weren’t his at all. Could these be thoughts from different regions of the brain? Make a list of five different kinds of thoughts you have experienced and think about how they might reflect different areas in your brain. In class, Bernard learns that neurons are connected to each other by branches called dendrites and axons. He watches a video that shows neurons firing glowing electrical bolts of energy through the branches to other neurons. To him it looks like a whole forest lighting up at once. Compare this to a computer network. What are some of the similarities? What are the differences? The Society for Neuroscience calls the brain “the most complex living structure known in the universe”. A human brain contains 100 billion neurons, forming trillions of synapses. That is a great deal of complexity in a very small space. How do you think this affects the way you think? During his journey, Bernard learns that everyone has a galaxy-like world inside their brain–their own brainiverse, and that neurons are alive. Do you find this a useful way to visualize the workings of your brain? If so, what would the world inside your brain be like? Write a paragraph describing your brain visualization and what you think would be going on in there right now. Ms. Needleman, Bernard’s science teacher, tells the class that the brain is made up of a right and left hemisphere, connected by the Corpus Callosum. While the two sides of the brain are complementary, the right hemisphere of your brain is considered the intuitive, creative part; the left side controls the logical, rational side. Make a chart with two columns, and on one side list the traits you have that would be considered “right brain,” and on the other the traits that are “left brain.” Do you think you’re more right brained, or left brained? Why? Is it the strength of the traits or the number of the traits that matters? How do you think the two hemispheres of your brain work together? What do you think the world would be like if people were ruled only by logic, without any emotion? What do you think it would be like if people were ruled only by emotion, without any logic at all? Can you think of ways to bring the two together? If you could design a brain, how would you do it? What would you do to ensure that the left and right hemispheres worked together? Would you even have separate hemispheres? How would you keep one side from taking over like in the novel Brainwalker, and making all the decisions? In the Middle-grade/YA novel Brainwalker, Bernard is often frustrated because he can’t find the words to explain what he means. The ideas are clear enough to him, but he has trouble communicating them to others. Since your speech centers are in your left hemisphere, is this a left brain or right brained trait? Have you ever felt the way Bernard does? Do you think being less verbal means you use the left side of your brain less? Make a list of five different techniques you might try to use to get your ideas across if you were in Bernard’s situation? If not being able to communicate your ideas easily in words is a disadvantage, can you think of a situation where you might be able to turn that to an advantage? In the book Brainwalker, Bernard feels that no one understands him – not his dad, not his teacher, not the other kids in his class – have you ever felt that way? How do you think this feeling arises in your brain? In the Brainiverse, Bernard meets a civilization of holons. One difference between holons and humans, is that holons can’t hide their feelings because their chest lights up a different color for each emotion they experience. That means that if they’re sad or scared or angry or happy, everyone knows it. It makes communications between different holons much clearer. List five advantages and disadvantages that you could see if humans showed their feelings all the time. One of the things that Bernard always hears is that he’s being controlled by his emotions. What do you think that means? Is it the same as having poor impulse control? Does it ever happen to you? Bernard’s science teacher, Ms. Needleman tells him that the mind doesn’t exist separately from the brain. This hypothesis is known as Monism, because it states that the mind and brain are essentially one and the same thing. Many Monists are also materialists, because the hypothesis fits well with the idea that there is only the physical world. The opposing hypothesis is called Dualism, which holds that the mind is something else, separate from the brain. Are you a Monist or a Dualist? If the mind is separate from the brain, what is it made of? Write a paragraph explaining your thoughts on Monism and Dualism. In the novel Brainwalker, Bernard is very excited about being the first person to ever set foot inside a brain. If you could be the first person to set foot somewhere or discover something where or what would it be? Why? People often think of science as being nothing but cold logic and numbers with no room for imagination or creativity. The truth is that that science is anything but cold. Albert Einstein used to imagine himself riding a ray of light to think about his theory of relativity? Friedrich August Kekulé discovered the ring shape of the benzene molecule after dream of a snake eating its own tail. Poincaré believed that sudden intuitions come from prolonged period of unconscious work. Do you think imagination, dreams and the unconscious are an important part of scientific discovery? Write a short paragraph explaining your opinion. Bernard’s father tells him that science is about coming up with hypotheses and theories, and then demonstrating them with experiments. But Bernard believes that free, unconstrained experimentation is needed in order to discover new hypotheses and theories. Write a paragraph comparing the two approaches. Which approach to you think would work better. Why? People often talk about “proving” theories, but scientifically speaking that’s impossible. You can only try to disprove one and fail. Do you understand why you cannot prove a theory? Write a short paragraph explaining whether you agree or disagree with this and why. In the beginning of the book, Bernard has a hard time coming up with a science experiment. If you had a similar assignment, what kind of experiment would you come up with? Write a paragraph describing your experiment and why you chose it. Bernard decides that his school science project should be to determine whether matter really exists. All his classmates laugh at him, because how could matter not exist, since we can see it, touch it, and bump into it. Do you think this is a good idea for a science project? What do you think of the idea that something could be true, even though everything around you seems to say that it’s not? Why? Write down five different points you could use to defend the idea that matter does not exist. In the novel Brainwalker, Bernard’s dad Floyd has stopped having new ideas, and this is causing him trouble at work. Once in his father’s brain, Bernard discovers that there is a drought of what the book calls energeia (a.k.a. mental energy) in the right side of Floyd’s brain, blocking Floyd’s creativity and intuition. Do you think we need intuition in order to have new ideas? Write a paragraph explaining the connection between intuition and creativity, and why even scientists need them.